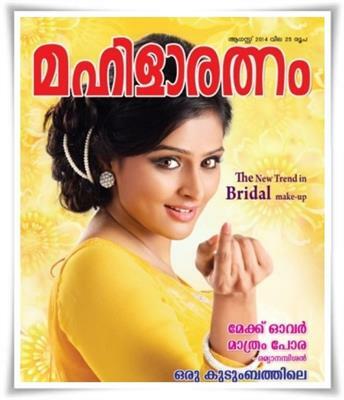 Mahilaratnam, one of the most trendy women magazine in Kerala has published the August 2014 issue. As done in the past, the current edition of Mahilaratnam is tight packed with exciting articles and photo gallery. The highlights of the August issue are new trend in bridal make up, interview with actress Remya Nambeesan and Seemattis's MD Beena Kannan, Ramzan special cookery, fashion- beauty- home tips with excellent photographs. In an exclusive article on new trend in bridal make up, various methods to dress up a bride is well described. Various tips related to skin care are given importance. Choosing the wedding dress is one of the most important parts of planning the wedding. One has to follow the latest hair and makeup trends to make the bride more beautiful. Keeping the tradition, the bride can be dressed up adding some imagination knowing the latest trends. Actress Remya Nambeesan shares her thoughts and views about her acting experience and habit in shaping skin and face. Remya speaks on her acting career and talent needed to sustain the industry. Beena Kannan, the MD of Seemattis in an exclusive interview talks about the path to become a successful entrepreneur. It would give an insight for the readers to know the inside stories of the woman industrialist. Being the Ramzan time, various recipes prepared by experts would keep the interest high for the readers. A special collection of tasty and healthy Ramadan recipes filled with nutrition would add more colour to the Iftar table. It will also ensure healthy eating during this Holy Month. These incomparable recipes can be used to prepare well balanced food. Other highly impressive articles on fashion- beauty- home tips would keep the readers intact. Novelty is the main factor that has popularized this magazine. Mahilaratnam has already influenced the life of many women delivering interesting connects on cuisine, beautification, dress, health, housekeeping and gardening. Aimed at the well educated women who wish to update themselves about the changing world, 'Mahilaratnam' is well liked by the present generation. Mahilaratnam magazine July 2014 issue is now in stands. The highlights of the current edition are exclusive photo shoot and interview with actor Rahman and family, Ramzan tastes, different types of blowses and a lot of reports on cookery, fashion and vasthu.